‘The Brain of Morbius’ remains one of the most beloved and iconic Doctor Who stories to have ever aired, fully embracing the gothic horror genre as the Doctor confronts one of the most commanding and influential figures from Gallifrey’s mysterious past. Given Big Finish’s penchant for bringing back classic foes over the years- even just within The Eighth Doctor Adventures six of the first fourteen episodes have featured the Daleks, Cybermen, Autons, or Zygons- ‘Sisters of the Flame’ is the first audio adventure to return to the ramifications of the events on Karn so long ago as the long shadow of Rassilon asserts itself once more in this first half of a two-part second season finale. ‘Sisters of the Flame’ acts like a Doctor-lite story from the televised David Tennant era as the Doctor is conspicuously absent from the majority of events after a time scoop is employed and the TARDIS mysteriously lands on a space freighter. Fortunately, the script does well to keep the thought of the Doctor present throughout without ever seeming forced, and writer Nicholas Briggs excellently brings Sheridan Smith’s Lucie Miller front and centre to confidently carry events. It’s blatantly clear just how much the Doctor and traveling with the Doctor mean to Lucie, and Smith imbues a genuine sense of despair to her performance as Lucie comes to believe that the Doctor is genuinely lost for good. Her uneasy but warming alliance with Alexander Siddig’s centipede-like Rosto and her innate ability to frustrate the returning Nickolas Grace’s Time Lord Straxus are unquestioned highlights and easily keep momentum going as Zarodnix’s obsession with Karn and Morbius as well as the Sisterhood’s mysterious desire to permanently erase the Doctor from time become known. 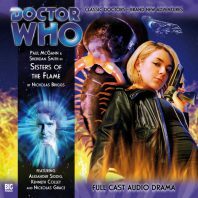 Perhaps unsurprisingly given that this is only the first half of a story and is thus charged with setting the scene, the pacing of ‘Sisters of the Flame’ is much slower than the other releases in this season of adventures. This undoubtedly allows the characters and their thoughts to gain more prominence and exploration, but it also means that much less happens than is typical in this range. Whereas the aspects of Morbius and the Sisterhood were introduced quickly and adeptly in the original television serial, simply introducing these aspects becomes the end point of the entire running time of this story; this approach by itself is not necessarily a poor choice, of course, but it does run the risk of the fallout of these introductions becoming incredibly rushed in the concluding ‘The Vengeance of Morbius,’ a question that only the conclusion itself will be able to answer. With that sentiment in mind, ‘Sisters of the Flame’ will appeal to some more than to others. The penultimate episode of a season is an odd time to less prominently feature the charismatic Eighth Doctor, but this story nonetheless has to be deemed a success based on the character work it allows and how spectacularly Sheridan Smith rises to the occasion as Lucie finds herself without the Doctor. However, with the scope of the true threat and its terrifying scope mostly withheld until the end, it also seems much smaller and insular than might otherwise be anticipated given its rather nostalgic title. Still, with a great cast and the genuinely appealing character of Rosto, ‘Sisters of the Flame’ comes to life wonderfully and ends up setting up the second half admirably by its end.